Now, people with all forms of astigmatism are potentially eligible to have laser vision correction. The CustomVueTM procedure, provides a revolutionary method of treating all forms of astigmatism. "The technology allows me to treat patients with a variety of astigmatic conditions, whether the astigmatism is associated with nearsightedness, farsightedness, or mixed astigmatism." says Dr. Brems. Now, more than 94 percent of the eligible population are potential candidates for the CustomVue procedure. Astigmatism is a common vision problem. Usually, it is caused by an irregularly shaped cornea. Sometimes it's the result of an irregularly shaped lens. Normal eyes are spherical, or shaped like a baseball, and astigmatic eyes are more oblong, like a football. When the eye is shaped like a football, the cornea has a steeper and a flatter curve and causes light rays to focus on two points in the back of the eye instead of just one. The CustomVue procedure treats all forms of astigmatism by changing the shape of the cornea with a laser. Patients with astigmatism can now experience potentially better vision than they can achieve with either glasses or contacts lenses. "This is an exciting advancement in the CustomVue procedure," says Dr. Brems. "Significantly more clinical study patients reported a high level of satisfaction with their night vision after this treatment for correcting all forms of astigmatism than before with glasses or contact lenses." At Brems Eye Center, we pride ourselves in the quality of our patient education. At your initial consultation, you'll have opportunities to meet the staff and to ask them questions. You'll also learn about the various forms of astigmatism and how the CustomVue procedure can be used by our doctor to tailor an individualized treatment just for you. During the consultation, Dr. Brems will determine if you are a good candidate for the CustomVue procedure. The WaveScanTM test is a part of the evaluation that is done. It captures unique imperfections in each individual's vision and provides 25-times more precision than standard measurements for glasses or contact lenses. WaveScan technology produces a detailed map of the eye-much like a fingerprint. No two maps are alike-in fact, each treatment is tailored to the unique imperfections of the individual's eye. "If the patient is found to be a good candidate," says Dr. Brems, "the WaveScan information is used to design an individualized treatment that is then transferred to the laser. This provides a new level of precision and accuracy, and potentially better results." If you have astigmatism in any form, there's never been a better time to receive laser vision correction. Call and schedule a free consultation and get your WaveScan test to determine if you are a candidate. 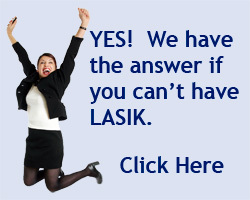 Call Dr. Brems at 602-200-0770 today or request a Free LASIK Consult online.